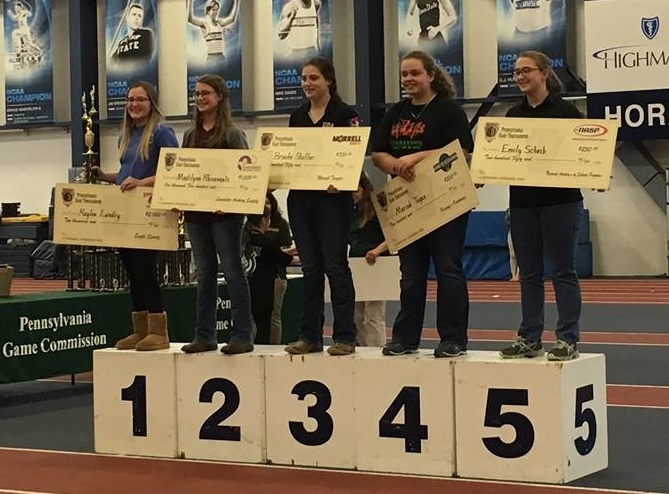 Susquehanna’s Kaylee Landry received a $2,000 scholarship at the NASP Pennsylvania State Championships. The high school senior was the top overall scorer of the tournament. Local archers were on target March 10 at the National Archery in Schools Program State (NASP) tournament held at Penn State University. 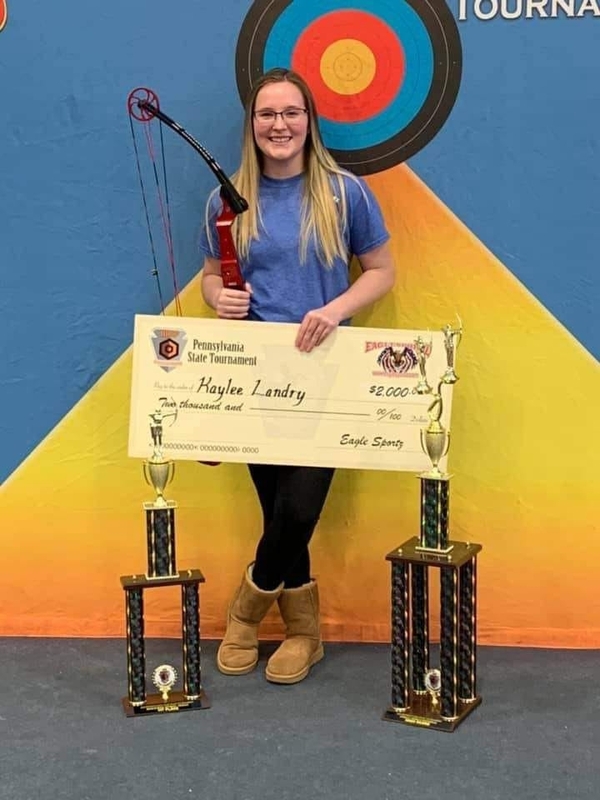 Susquehanna Community senior Kaylee Landry registered a score of 296 out of 300 to claim the top High School Girls spot and held the highest overall score of both male and female divisions. “She’s very dedicated to the sport and thoroughly enjoys it,” said Susquehanna Coach John Ord. After just missing to qualify for Nationals a year ago, Landry set her sights on accomplishing that task. “Leading up to states we often practiced a couple times a day,” noted Ord. Montrose’s Mercedes Strohl also finished in the top ten of the High School girl’s division with a score of 285 to claim seventh place and lead the Meteors High School team to a fifth-place finish. Montrose Area teams and competitors also came away with some hardware. The Montrose Area Middle School and Lathrop Street Elementary teams both took first in their divisions. The Lathrop Street point total of 3149 became the highest score in the event’s history. Rhinevault finished with a score of 295 to claim the overall Middle School title and second overall in the tournament behind Landry. Rhinevault was joined by teammates Makenzie Krupinski (285) and Hannah Rebello (279) on the top ten middle school female list. She credited the support behind her for her success. “My dad and the other coaches have spent a lot of time coaching us,” said Rhinevault. In the Elementary division Lathrop Street Elementary claimed the team title and Choconut Valley finished fifth. Lathrop Street was led by Aiden Sprouse (282) and Ava Castrogiovanni (271) who finished at the top of the male and female divisions. respectively. Sprouse was joined in the male top ten by Mark Hawk (264) who finished fourth and Joshua Starzec (263) who came in fifth. Elk Lake’s Camden Ruark finished seventh with a score of 261. Sprouse felt his ability to control his breath was a key factor in finding success at the tournament. Lathrop Street placed five others in the top ten of the female division as Hailey Aukema finished just behind Castrogiovanni with a score of 270. Alanna Welsh (262) was fourth, followed by teammates Abigail Rozell (260) in sixth; Carley Frey (257) in eighth; and Ava Bell (254) in ninth. Max Stashko (246) paced the Choconut Valley entry finishing 15th in the male division, while Hailey Hollenbeck (228) was their top elementary female finisher. In the male division, Montrose’s Julian Johnson finished sixth with a score of 282. In the High School division several other local archers finished in their division’s overall top 20. Montrose’s Zachery Oleniacz finished 12th in high school boys and was the fourth highest junior. He was joined by Elk Lake’s Ethan Brown who finished 20th. On the girls’ side Montrose freshman Mia Amorino finished 14th and was the fourth overall freshmen female. Her teammate Jennifer Tometchko finished 16th and was the sixth-place senior female. The teams and individual qualifiers will prepare for the national tournament to be held in Louisville, Ken. Be the first to comment on "Local archers aiming for nationals"